I was looking at some foreign language websites and came across these recent 'UFO' sightings. 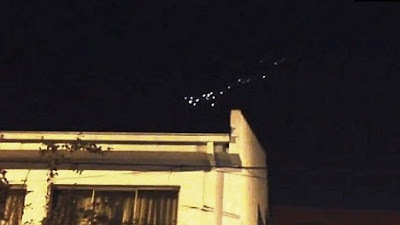 The above photo was taken in Temuco, southern Chile and has been described dramatically as a UFO Squadron or maybe it's simply something entering the earth's atmosphere and burning up. The Chile reference made me remember when I was a student and worked in a television and radio shop. The 'super smooth salesman' was trying to sell a radio to a pretty young woman and told her how it would receive hundreds of radio stations and - if she sat by an open window - she would even get Chile. No idea why I thought of that! 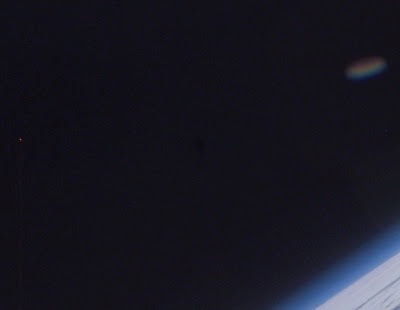 And a slightly bigger, but not so clear image, with a tiny red dot and line to the left of the photo. Interesting. The "object" in the video looks like it could be a large single craft as opposed to being a squadron. 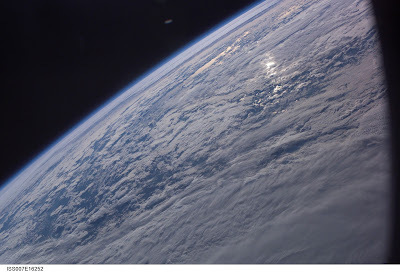 The next photo of the earth, object, red dot and line are most intriguing to me. I would say the red dot (leaving a red trail) is a creature in rendezvous with the ship.(really). Yes the lights, like dots, could all join up. Interesting what you say about the red dot - and trail - thanks. The video sure has an authentic feel to it, what with the barking dogs and the traffic. Very interesting. The photo is good, too. Chile seems to have a lot of sightings, including one in 2010 at an air show, where a craft was captured by several different cameras, from different angles. It seems to be a genuine video, but wonder what it is?